The government has announced that the trend in unemployment will be reversed by the end of 2013. The number of jobseekers registered in category A with France’s Pôle Emploi job centre at the end of September increased by 60,000. The number fell during August by 50,000, mainly due to a “bug” in sending SMS texts, which led to an unusually large rise in the number of terminations due to the claimant’s failure to stay up to date (up 72,000 over the previous month). An increase in enrolments for the month of September due to the re-registration of jobless people who had been unduly terminated was therefore expected. The number of jobseekers registered in category A thus rose by 10,000 between July and September 2013, which meant that the trend is still upwards but at a more moderate pace than earlier in the year. These large variations in the very short term in the numbers registered with the ANPE job centre make it impossible to give a precise idea of upcoming trends in employment and unemployment. 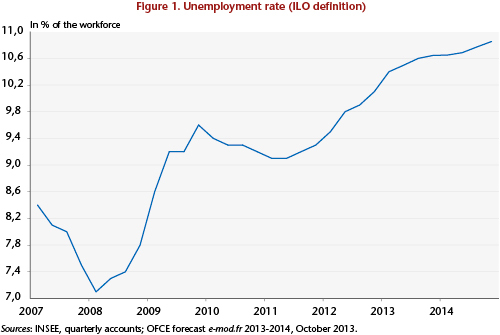 Our analysis of the labour market up to 2014, which is set out in the latest OFCE forecasts of October 2013, suggests that no significant improvement in unemployment is expected by the end of 2014. In an attempt to reverse the trend in unemployment, the government has planned for the rapid expansion of subsidized jobs in the non-profit sector (Emplois d’avenir, Contrats Uniques d’Insertion – Contrats d’Accompagnement dans l’Emploi (CUI-CAE)). Joining these programmes are the CICE tax credit for competitiveness and employment together with “generation contracts” in the commercial sector, whose impact on employment will begin to be felt in 2014. 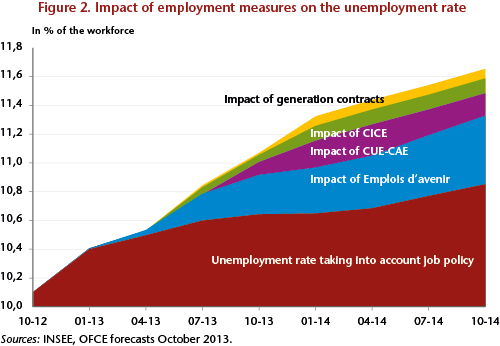 All these measures to promote employment will help to stabilize the unemployment rate by late 2013/early 2014, with continuing job losses in the private sector until the end of the year. The unemployment rate will then begin to rise again until the end of 2014, since job creation in the non-profit sector will be insufficient to absorb the increase in the labour force. In retrospect, an initial reversal of the trend in unemployment began in 2010 and was then interrupted in 2011, as unemployment started to rise again under the impact of a series of austerity measures. The unemployment rate was creeping toward the record levels hit in 1997, rising from 9.1% in early 2011 to 10.5% in the second quarter of 2013 (Figure 1). After a bad year in 2012 (66,000 jobs lost), the labour market continued to deteriorate in the first half of 2013, as job losses in the private sector continued at the same pace as in the second half of 2012 (-28,000 jobs on average each quarter). The number of unemployed thus continued to increase (+113,000). To try to stop this downward spiral and reverse the rise in unemployment, the government is relying in the short term on expanding the Emplois d’avenir and CUI- CAE subsidized job programmes. The gradual introduction of Emplois d’avenir jobs has resulted in 31,566 hires between January and August 2013 in France. A total of 70,000 hires are expected in 2013 in mainland France and 70,000 more in 2014. There is, however, a deadweight loss for this type of programme: according to Fontaine and Malherbet (2012), 20% of the jobs created through the Emplois d’avenir scheme would have existed even in the absence of the subsidy. The net impact is thus expected to be 56,000 jobs created in 2013 and in 2014. The impact of this job creation will be especially important since these involve long-term contracts (1-3 years). People hired in 2013 will still be in their jobs in 2014, and the Emplois d’avenir jobs created in 2014 will indeed constitute net job creation. As for the CUI- CAE programme, the number of contracts budgeted at the beginning of 2013 was the same as the previous year (340,000 for the whole of France, including 310,000 for mainland France), with 50% of these in the first half year. In order to reverse the trend in unemployment by the end of the year, in June 2013 the Ayrault government announced an extension of 92,000 contracts in the non-profit sector. This brings to 262,000 the number of contracts signed in the second half year, and 432,000 for the year. As in 2013, 340,000 contracts are planned in the 2014 Budget Bill (PLF), but the budget allocation is nearly 20% larger, which will fund an increase in the stock of CUI-CAE. These will increase until the first half of 2014, reaching 250,000 by end 2014. The government is thus reactivating the social treatment of unemployment through greater use of short-term subsidized jobs (7-12 months), but at a level comparable to that seen in 2007 and in 2010. 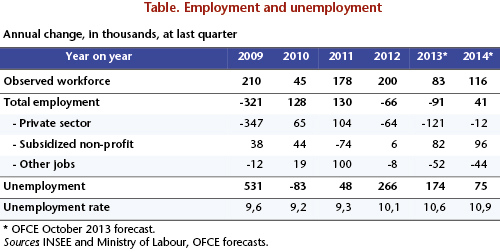 In contrast, there will still be significant job losses in the private sector up to year-end 2013 due to companies being overstaffed (see our October 2013 forecasts). Subsidized jobs in the non-profit sector (+82,000 in the last quarter of 2013 compared to the last quarter of the previous year) will nevertheless stabilize the unemployment rate at around 10.6% in late 2013 / early 2014. Total employment began rising again in 2014 (41,000 jobs), driven by the creation of subsidized jobs in the non-profit sector, but also by the expansion of the generation contract and CICE programmes. The CICE, which is open to all businesses, will be equivalent to 6% of payroll, excluding employer social security contributions, and corresponds to wages of less than 2.5 times the minimum wage (SMIC). According to the assessment made by Mathieu Plane (2012) using the e- mod.fr model, the CICE will decrease labour costs in the private sector by on average 2.6%, which should result in the creation of jobs, both by promoting the substitution of labour for capital and through gains in competitiveness. In total, by 2018, five years after its establishment, the CICE will have created 152,000 jobs, thus lowering the unemployment rate by 0.6 percentage point. At the horizon of our forecast, it will have created 46,000 jobs, or half the government’s forecast (91,000). The generation contract covers unemployment among both younger (under age 26) and older workers (over 57). It consists of the creation of a permanent contract (CDI) for a young person, linked to the promise of non-dismissal of an older worker for a period of 5 years. In return for this commitment, the company will receive a lump sum grant of up to 4,000 euros per year for 3 years. This type of measure runs the risk of generating significant deadweight effects. Overall, the measure will result in 99,000 new jobs in the private sector, with the signing of 500,000 generation contracts over the 5-year period. In September 2013, 10,000 generation contracts were signed. Under the assumption of a gradual ramp-up by the end of 2013 (20,000 contracts signed), with 100,000 contracts signed in 2014, this should correspond to the net creation of nearly 4,000 jobs in 2013 and about 20,000 jobs in 2014. Despite this, unemployment will continue to rise over the two years (+174,000 in 2013 and +75,000 in 2014 compared to the same quarter of the previous year), due to a still dynamic workforce (+116,000 in 2014 after +83,000 in 2013 ) and a lack of net job creation in the private sector (see the table above). Given the subsidized jobs in the non-profit sector as well as the private sector programmes, the unemployment rate in mainland France will temporarily stabilize at 10.6 % in the fourth quarter of 2013, before gradually creeping up to 10.9% of the workforce in mainland France by late 2014. By the end of 2014 it will surpass the historic peak reached in the first half of 1997 (10.8% of the workforce), with no prospect of reversing the trend over our forecast horizon. However, without the impact of the jobs programmes, the unemployment rate would have increased much more, to 11.6 % at end 2014 (Figure 2). See the OFCE Note of July 2012 on “An assessment of the 2012-2017 five-year economic plan”. Companies will benefit from this aid, including for the jobs they would have created even in the measure’s absence. The way the measure is implemented should limit the deadweight loss: aid linked to the implementation of the generation contract will for instance be reserved for companies with fewer than 300 employees. Companies with over 300 employees, where the risk of a windfall effect is greatest, will be obliged to set up the programme on pain of financial penalty. In addition, the lump sum of 2000 euros represents a total exemption from employer social charges at the level of the SMIC, and above that decreases in proportion to the salary. This helps to limit the windfall effect, since the elasticity of employment to labour costs is higher for low wages. ← Is it pointless to separate banking activities?